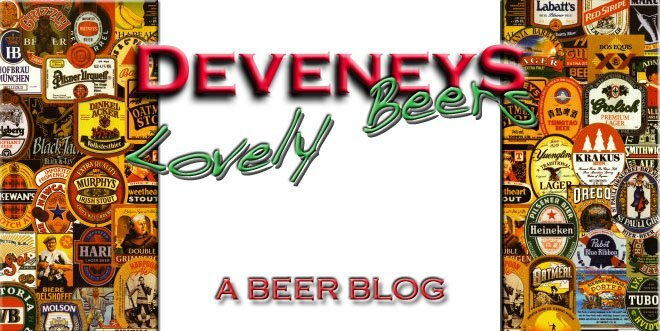 Deveneys of Dundrum: Flying Dog. 'Good people drink good beer' - Hunter S. Thompson. 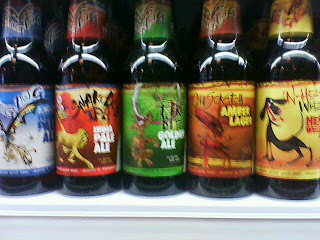 The Flying Dog brewery from Denver, Colorado and Frederick Maryland, quirky beers and definitely marketed by men- the labels say it all!! Haven't yet opened a bottle but will post over the weekend with verdict. Snake Dog IPA - Bursting with flavour. I knew right away as the beer had been in the fridge for weeks (how did that happen?) and was way too cold to be enjoyed like a proper ale. That said, the fruit flavour and hoppiness shone through and left me really impressed. I thought that it might make the beer unbalanced or overpowering when it warmed up to the right temperature but it didn't really have an impact, either that or my palate had already been sufficiently prepared for each enjoyable sip (glug?). The hop content really makes this beer refreshing, especially as it doesn't come across in the harshly bitter manner that many boutique IPA's can. Well made stuff. In-heat Wheat Hefe-Weizen - It definitely has the typicity of what it is down pat - a virtual clone of the many North American wheat beers that I've tried. They all have that taste that tells you that they are made from wheat instead of barley or god forbid rice. They have a refreshing quality to them due to this slightly more mellow grain taste. The disappointing thing here was that due to being unfiltered you expecting to try a beer that has that lovely banana and clove quality that many of it's German cousins have in various degrees. Sadly, they are lacking and for my tatse that's what I really love about Weiss biers. All that said, it's definitely a refreshing summer guzzler that any lager drinker would probably appreciate. It actually may as well be filtered to appeal more towards this consumer. The flavour reminded me more of many good filtered wheat beers. Pity I'm not a huge mainstream lager fan - it definitely does what it says on th package though - perfect for the heat. I'm glad to hear about other people liking Flying Dog, as I am a huge fan.. just to let Deveneys know, their marketing team actually isnt solely men, it is actually run by a younger team of men and women.. infact the Marketing department is directed by a young woman by the name of Stephanie, who I was fortunate enough to meet while doing a tour of the brewery. They clearly do a great job marketing to all demographics. AS for the beer, I love it.. personal favorites are the old scratch, the gonzo imperial porter, and although I am not a huge fan of hoppy beers, I do like their IPA every now and then.. now that I think about it, I could enjoy most of their beers while disliking their competitors' beers of similar style. Anyways, glad to hear you all like the mid-sized brewery of the year as much as I do!